"SBC-2 v2.5" is a slightly midified version of the 2.3 board. 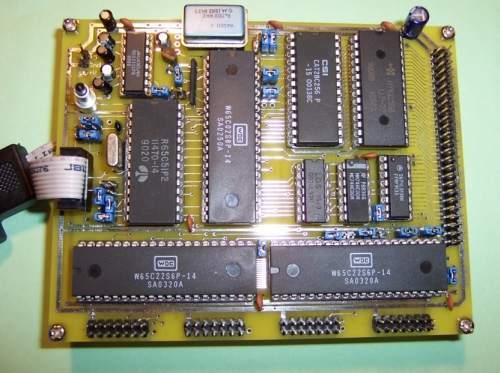 It includes space for a 1 MHz 65c02, 32K of static RAM, and 32k of EEPROM. It also has two 65C22 Versatile Interface Adapters (VIA) and one 65c51 Asynchronous Interface Adapter. The modifications include addition of a 7805 voltage regulator, more space around the EEPROM pads to allow for a ZIF socket, reconfiguration of the Serial port Connector, and addition of all address lines to the expansion connector. There are eight 16-byte address blocks decoded for I/O, the on-board I/O chips use three of these (their CS pins are connected via jumpers and may be disabled). There are 5 unused address blocks available for more I/O through the expansion port. In addition, by adding one 74LS138, you may decode an additional eight 16-byte I/O addresses. All 3 I/O chips have jumper-selected interrupt connections to either the IRQ or NMI on the 65C02. I've included some user-selectable options to the serial port and also added a better reset circuit. You can now select the handshake signals that you want to place on the port, like CTS/RTS or DSR/DTR or DCD. You can also use a capacitor for a simple power-on reset circuit or use a DS-1813 or equivalent reset device. This will provide a cleaner, more reliable reset pulse to all of the IC's. I also included jumpers to allow a choice of EPROM/EEPROM's, added pads for unused 65C02 pins, and the 6551 RX Clk. I have developed a monitor program with basic INPUT/OUTPUT support, a mini-assembler, and also Lee Davison's Enhanced-BASIC Interpreter. This will make the board a very practical SBC! All info provided "as-is" and is Copyright 2010.